A celebrated roster of 81 PGA Champions Tour players took to The Old Course at Broken Sound Club for 54 holes of stroke February 4th-10th for the 2013 Allianz Championship, all vying for a $1.8 million purse. Spectators were treated to an exciting, down-to-the-wire finish, as well as many special “events within the event,” culminating with PGA Champions Tour rookie Rocco Mediate joining the impressive ranks of legends such as Arnold Palmer, Gary Player and Jack Nicklaus in winning their Champions Tour debut. Mediate set a tournament and course record 11-under 61 in the second round of play and held off Tom Pernice Jr. and Bernhard Langer to win with a 17-under 199, earning him $270,000 prize money. Mediate is an American golfer who has won six times on the PGA Tour. He has been featured in the top 20 of the Official World Golf Ranking and is widely considered one of the best putters in golf. The most notable moment of Mediate’s career came in the 2008 U.S. Open at Torrey Pines South Course where he finished as the runner-up in a sudden-death playoff to Tiger Woods. In 2010, he became the oldest wire-to-wire winner on the PGA Tour since 1970. In addition to the tens of thousands at the course, more than 83 million national households and 150 million in more than 174 countries tuned into the Golf Channel saw Boca Raton at its best, with all three rounds televised live from The Old Course at Broken Sound Club. The Old Course at Broken Sound Club hosted the PGA Champions Tour’s first full-field event of the season that included a series of interactive, “up close and personal” pre- and during tournament events for golf fans of all ages, while driving net proceeds to benefit the Boca Raton Regional Hospital. An impressive roster of PGA Champions Tour legends, including defending champion Corey Pavin, 2011 winner Tom Lehman, 2010 winner Bernhard Langer, Mark Calcavecchia, Fuzzy Zoeller and others teed off to compete for a $1.8 million purse during championship play at the Allianz Championship. Continuing an Allianz Championship tradition and getting the ladies into the swing of championship golf, LPGA legend with 72 LPGA victories and eight-time “player of the year” Annika Sorenstam gave 36 executive women (nine foursomes) expert golf and business tips at the Women’s Power Breakfast, Clinic and Pro-Am. The event offered the opportunity to participate in a golf and business networking experience like no other while giving all skill sets a chance to play nine holes with a PGA Champions Tour player, as well as a private group clinic with Sorenstam presented by JM Lexus, followed by an “up close and personal” Q&A session. The events continued with two days of Championship Pro-Am play, with 104 men’s foursomes teeing up memorable rounds on the green paired with a PGA Champions Tour pro. The tournament aimed to continue towards green event benchmarks set by the 2012 Allianz Championship, keeping the event one of the “greenest” of its kind. In addition, more than two-and-a-half pallets of unused food was donated to Boca Helping Hands following the event, which will be used to feed local individuals, families, and children through programs designed to instill dignity and break the cycle of dependence. “Family Day” sponsored by Tommy Bahama featured a full schedule of free interactive family activities for all generations, including appearances by South Florida sports team mascots, face painting, a bounce house, putting contests, Don Law golf clinic, and much more. As part of the 2013 Allianz Championship tournament event week, wine connoisseurs and golf enthusiasts enjoyed a perfect alfresco afternoon with legends of golf while sampling reds and whites while overlooking the 18th green at the fourth-annual “Grapes on the Green” Golf & Wine Experience presented by the Boca Raton Bridge Hotel. In addition to indulging in the varietals from international vineyards, attendees enjoyed culinary samplings from top area restaurants including Carmen’s Top of the Bridge, WaterColors at the Bridge Hotel, Morton’s The Steakhouse, RED The Steakhouse, Rosso Italia, Salt 7: Prime Steaks and Sushi Dining, Rebel House, Broken Sound Club, live entertainment and a special VIP auction. A new annual fundraising tradition was launched this year by the Moabery Family Foundation that pledged an annual “champion’s challenge,” donating $1,000 for each birdie and $5,000 for each eagle scored by the defending champion during Allianz Championship play to benefit Boca Regional’s Toppel Family Place Neonatal Intensive Care Unit. 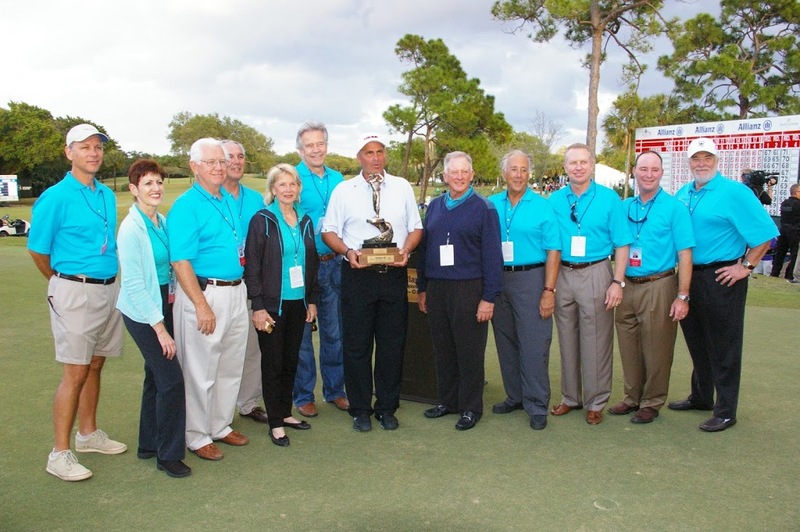 This year the 2012 winner Corey Pavin’s play was good enough to secure a $17,000 donation presented on the green by Abdol Moabery, president and chief executive officer of GA Telesis, whose son Chase spent three weeks in the NICU after his wife Cathy gave birth. Allianz Life Insurance Company of North America had announced that it would be donating $1,000 for every birdie from Allianz-sponsored golfer Tom Lehman at the upcoming Allianz Championship, shared between the southern Florida chapters of Junior Achievement and the Alzheimer’s Association. The company donated for each of Lehman’s 17 birdies during the tournament, bringing the total to $8,500 for each organization. Lehman tallied five birdies on Friday, five on Saturday and seven during Sunday’s final round, finishing tied for 6th place with a total score of 207. Allianz Life partners with Junior Achievement and the Alzheimer’s Association in the Twin Cities because of their focus on organizations that support improving financial literacy and providing services to seniors. More than 100 major sponsors came together to support all aspects of the celebrated week-long event, including Allianz Life Insurance Company of North America, JM Lexus; 3M; Office Depot, Infinity Sales Group/Dish Network, Penn Florida, Konica Minolta Business Solutions, FAU, Kaye Communications, Inc. and more, many for the seventh consecutive year; since the tournament relocated to Boca Raton. Collectively, the Champions Tour has the most recognizable and accomplished players in the game with many of its 30 members of the World Golf Hall of Fame competing regularly in its events and numerous other major championship winners among its members. The Champions Tour is a membership organization of professional golfers age 50 and older. Conceived in 1980 as the Senior PGA Tour, it started with just four events and purses totaling $475,000. Points earned in 26 official Charles Schwab Cup events in 2013 will determine the Charles Schwab Cup champion, the season-long competition designed to recognize the Champions Tour’s leading player. The Champions Tour’s primary purpose is to provide financial opportunities for its players, entertain and inspire its fans, deliver substantial value to its partners, create outlets for volunteers to give back, protect the integrity of the game and generate significant charitable and economic impact in communities in which it plays. In 2012, tournaments on all five Tours (PGA TOUR, Champions Tour, Web.com Tour, PGA TOUR Latinoamerica, PGA TOUR Canada) generated more than $122 million for local charitable organizations, bringing the TOUR’s all-time total of charitable contributions to more than $1.8 billion. The Commissioner of the PGA TOUR is Tim Finchem. Mike Stevens is President of the Champions Tour. The PGA TOUR’s website is pgatour.com, the No. 1 site in golf, and the organization is headquartered in Ponte Vedra Beach, FL. Follow the Champions Tour at Facebook.com/ChampionsTour and on Twitter @ChampionsTour. Broken Sound is considered one of the premier golf course communities in Palm Beach County, FL. It features resort-style, country club living in 28 private villages and has 23 tennis courts, a state-of-the-art fitness/spa center, poolscape and bistro, dining facilities and two of the finest Audubon Society Certified golf courses in South Florida. The original Broken Sound Club, now affectionately known as “The Old Course”, was founded in 1978 and designed by Joe Lee and has hosted the PGA Champions Tour tournament, the Allianz Championship for seven consecutive years. Gene Bates completed a redesign of The Old Course in January 2004. The Old Course features an abundance of trees unique to South Florida and rolling fairways that give it a feel similar to courses in the Pinehurst, NC area. It includes the largest stand of natural Florida maples trees in the county. The Club Course, another Lee design, was opened in 1985 and also recently renovated by Bates. Broken Sound is located on the north side of Yamato Road on Old Course Way between Congress Avenue and Military Trail.